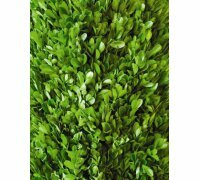 Preserved boxwood is obtained through the process of stem absorption of a preserving natural glycerin solution and dyes to maintain the fresh look. In the fresh state boxwood it is commonly used in many gardens as hedges, plants and suitable for topiary trees. These natural boxwood products are only for indoor use only! 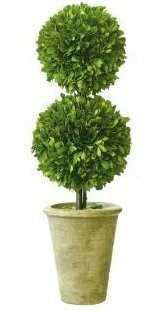 The preserved boxwood is a great alternative to silk topiaries, and will require practically no maintenance, besides watering. Yes, you spray the leaves with water every few months to maintain the freshness. My importer offers it in bulk or in the various designs presented below. 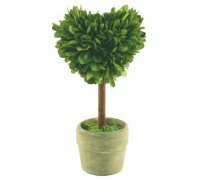 I personally dealt with this company since 1994 and they have developed a truly unique line of preserved boxwood topiaries and décor elements which is very versatile in different occasions. 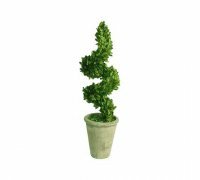 The bulk preserved boxwood used for the designs can be also purchased in bulk. You can make your own beautiful and creative preserved boxwood creations and displays. Each case comes with 4.4 pounds of product, you'll have plenty for the most demanding design or display idea. The package is based on weight, (Approx. 4.4 pounds) the number of branches (Approx. 17 to 20 pieces)and each case will vary as it is a natural product. The branches are approximately 18 inches long. 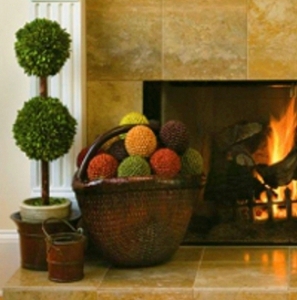 The preserved boxwood topiaries are handmade and painstakingly shaped to perfection. The ceramic pot is included. Pots can be repainted or placed into bigger pots by you, if needed. 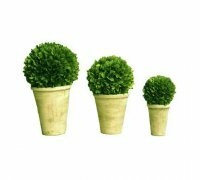 The double ball topiary is measured from the bottom of the clay pot to the top of the highest ball. and perfect for a foyer or any room needing to enrich a corner spot. 12 inches height $40 for a pair. 11 inches height $50 for a pair. 9.25 inches height $28 for a pair. 6 inches height $36 for 4. 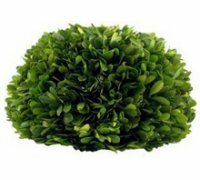 The preserved boxwood wreath is available in the round or square shape. In addition there is a heart, and spheres of different sizes. You get one of each of 10",8",6" diameter. 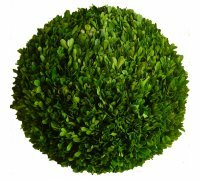 Preserved boxwood half-ball 10" $80 for a pair. Preserved boxwood wreath square 11" $50 for a pair.